An article from Johanna Mejia, the founder of Amalena about fair gold and artisanal and small scale mining was published in the Austrian magazine DKWE. 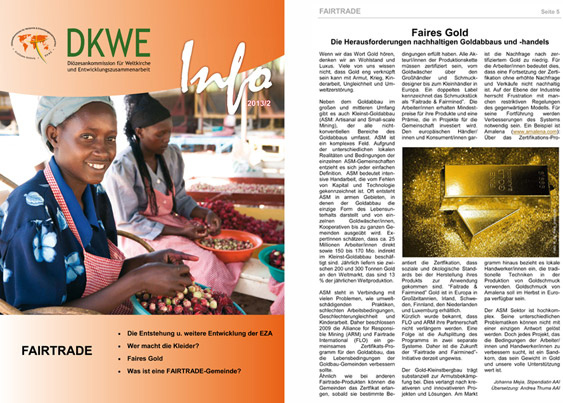 DKWE is a magazine from the Diocese of Salzburg and this issue was dedicated to Fair Trade. The article talks about the characteristics of the ASM sector(artisanal and small scale mining), the certification system Fairtrade and Fairmined and the split up of this certification scheme into two different systems managed independently by each organization. You can download a pdf version of the magazine (in German). A couple of months ago our Triana earrings have been featured in the jewelry trend section of Vogue Spain. A very exciting moment for us we want to share with our English readers with a rough translation of the article below.